Lions and tigers and DeLoreans, oh my! 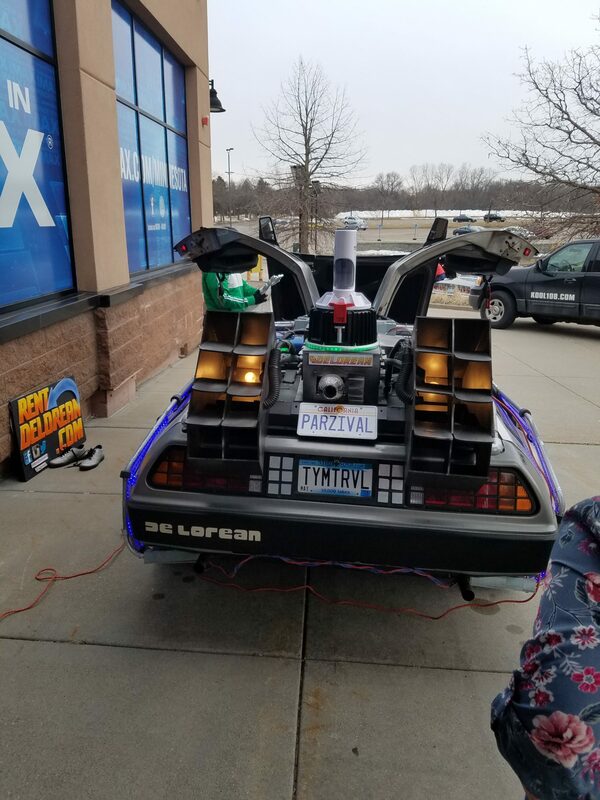 That was the scene at the Minnesota Zoo on Wednesday, March 28, for the IMAX premiere of the long-anticipated Ready Player One. 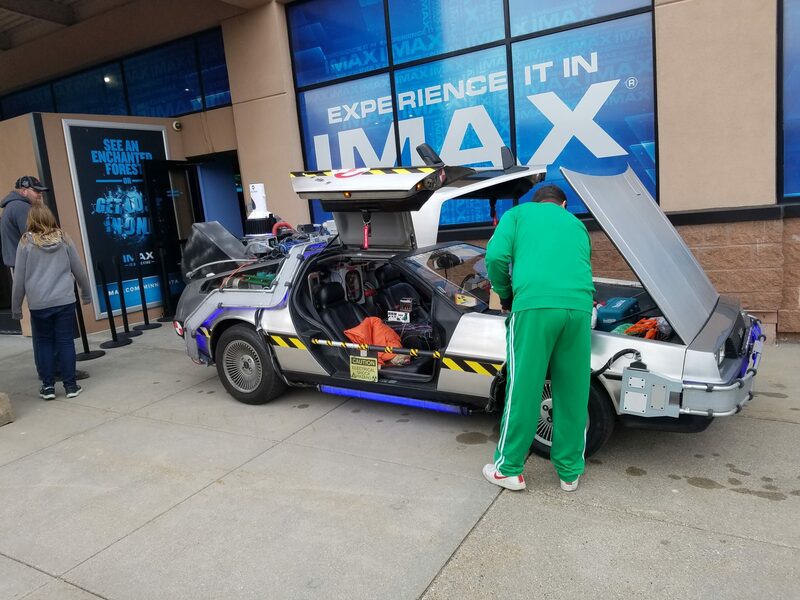 The film, based on Ernest Cline’s best-selling novel, is a pop-culture wonderland filled with hundreds of movie, television, and video-game references from the ’80s and beyond, so it’s no wonder Back to the 80s Minnesota would plan a grand event for all us geeks. 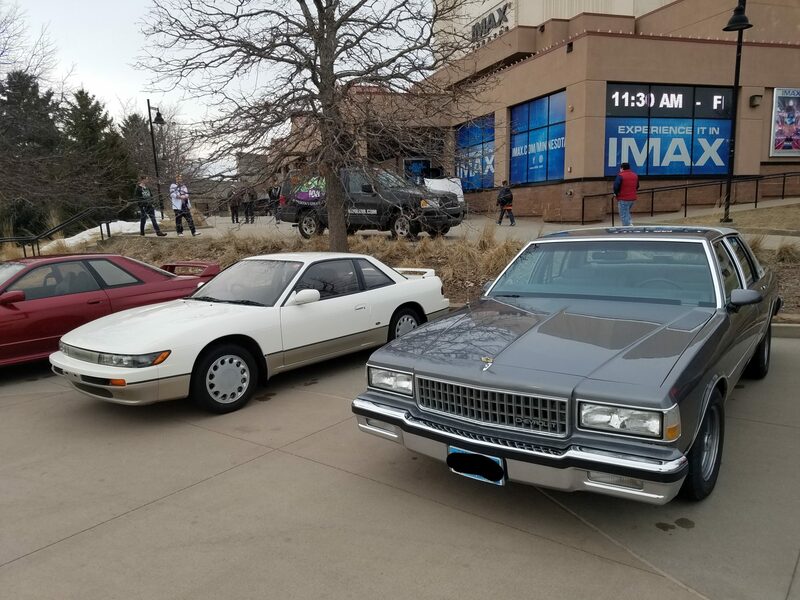 Cars of the ’80s on display . . .
A number of ’80s car enthusiasts brought their metal babies to the theater for moviegoers to see. Models included a Pontiac Fiero, Nissan Skyline and Sylvia, and a Chevrolet Caprice (full disclosure: the Caprice belongs to my brother). And of course, the lineup wouldn’t be complete without a DeLorean, whose owner was decked out in full Marty McFly gear from the first Back to the Future movie. His accessories were fantastic, with the video camera, car remote control, and flux capacitor. Marty McFly and his Back to the Future DeLorean. But the highlight of the vehicles in attendance was clearly the fully customized DeLorean brought by Andy from RentDeLorean.com. Initially dressed as car-waxing loser Biff Tannen, Andy displayed a number of amazing upgrades. 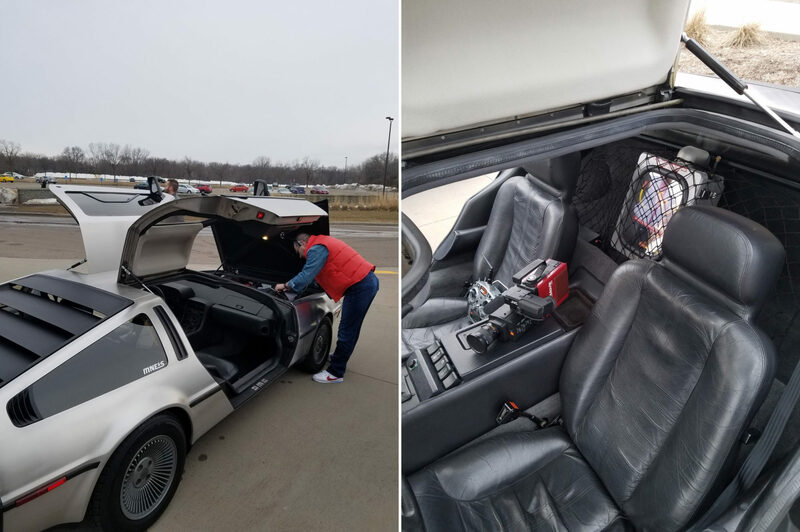 The Mr. Fusion, exhausts, running lights, and hoses from Back to the Future were already there, but Andy had added Ghostbusters decals on the doors, KITT’s oscillating light from Knight Rider on the front, and a Ready Player One PARZIVAL license plate specifically for this event. Andy from RentDeLorean.com setting up his display. More Back to the Future accessories. Inside the theater, Issues Needed Comics gave away free comic books, and KOOL 108 ran a little game to give away prizes (though none of them had anything to do with the film or geek references). 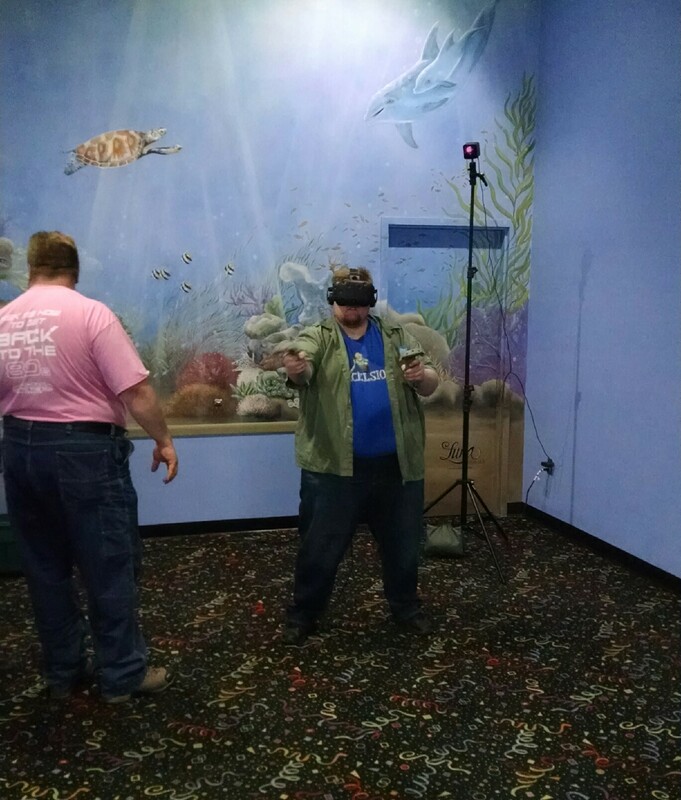 The most exciting activity indoors was the full virtual-reality setup. Even if you’ve done some basic VR in the past—a simple helmet or just plugging your phone into one of those little boxes—getting the full experience of goggles, headphones, and joysticks is so much more exciting. Back to the 80s had a number of different scenarios to play, such as deep-ocean diving, skyscraper jumping, and even Fruit Ninja. I opted for the space-pirate game, which outfitted me with a laser gun and force-field shield to fight against flying robots. It really felt a lot like being in Ready Player One’s OASIS. The events were capped off by a costume contest before the movie. Entrants included an Indiana Jones, some ’80s jumpsuits, and an actual ’80s graduate in her letter jacket. However, they were all surpassed by the winner, Ryan Schmidt, dressed as Ready Player One‘s Parzival—quite the impressive feat for a movie that hadn’t even premiered yet. 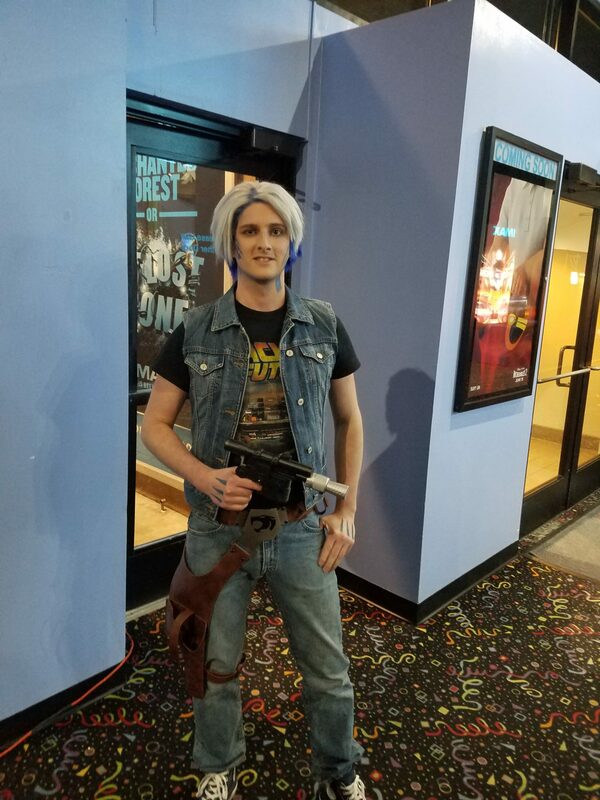 Costume-contest winner Ryan Schmidt as Parzival. The event was fantastic, and if I had all the money, I’d have that DeLorean sitting in my driveway all year long. Ready Player One is in theaters now and you can read Twin Cities Geek’s review right here. 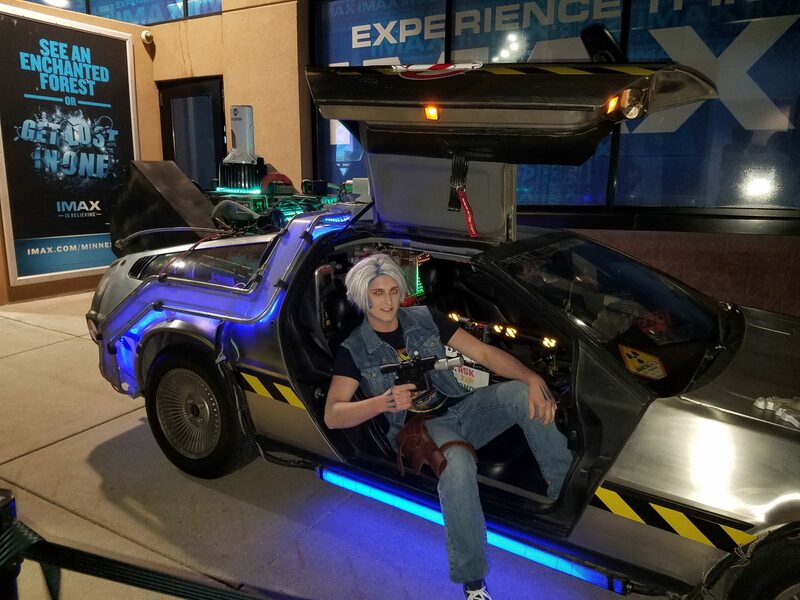 Parzival (Ryan Schmidt) in “his” DeLorean. 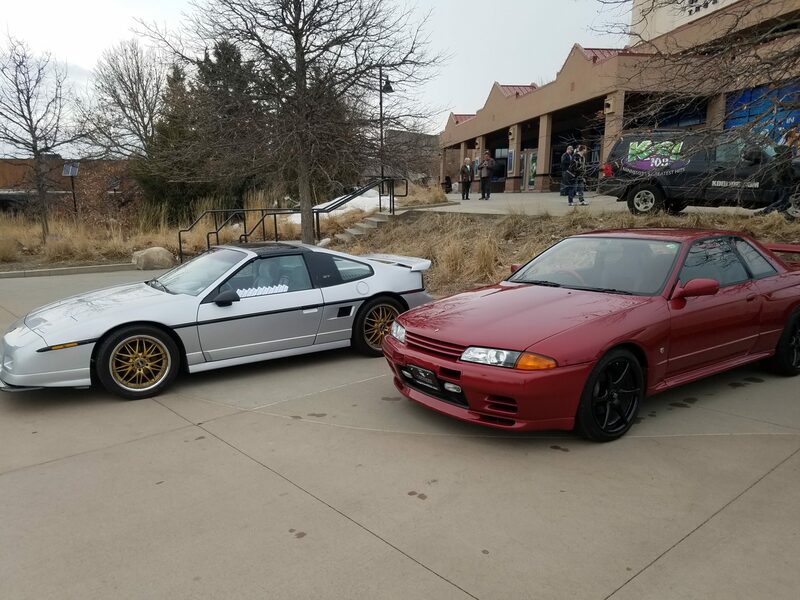 From the Back to the 80’s – MN team, thanks for the great write-up! We had a blast at the IMAX Theaters at the Minnesota Zoo for the event. Quick ping on correcting the date of the event from Apri 28th to Mar 28th. Whoops—awkward! Thanks for the catch.